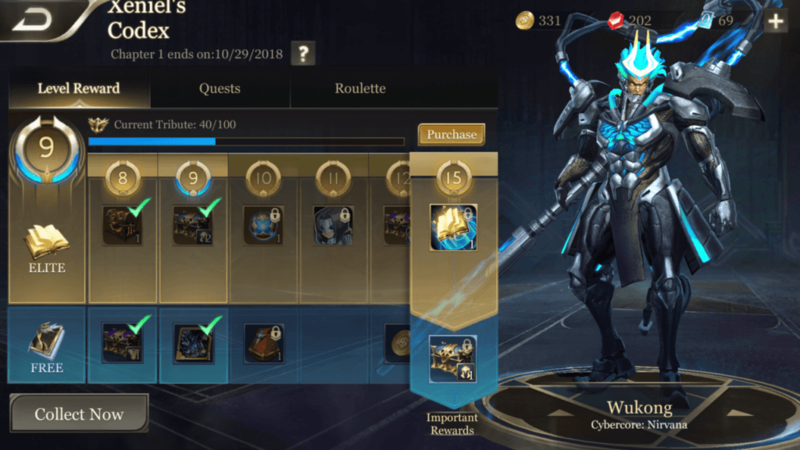 HomeArena of Valor (AoV)What are AoV Prime and Xeniel’s Codex and Are They Worth It? 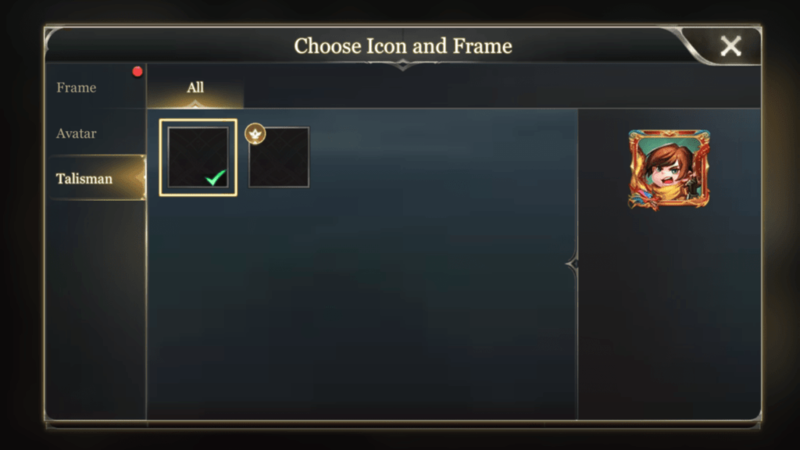 Arena of Valor (AoV) - What are AoV Prime and Xeniel’s Codex and Are They Worth It? A number of new features were added into the game with the most recent patch. Not only do players get to experience a new map with new monsters and visuals, but some new systems have been added to the overall game experience as well. 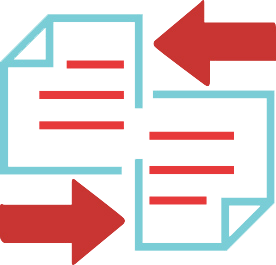 These can be a bit confusing to some, the names not offering much insight into what they are, so we unpacked the systems to better explain the features to users. 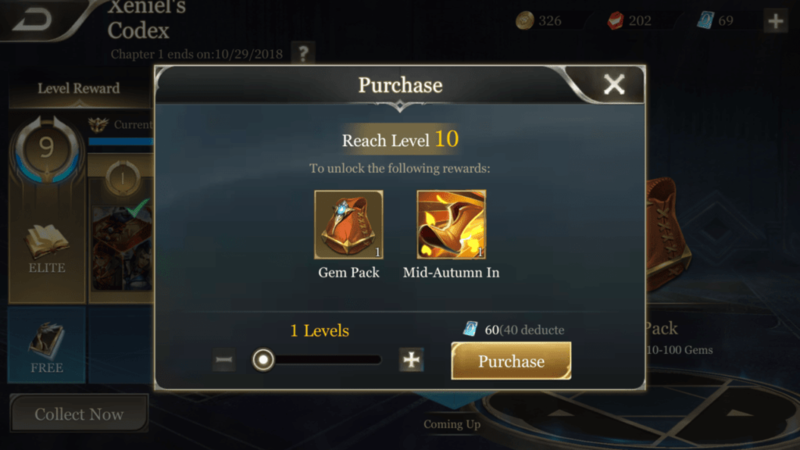 A new premium subscription-like service has been added to the game in the form of AoV Prime. 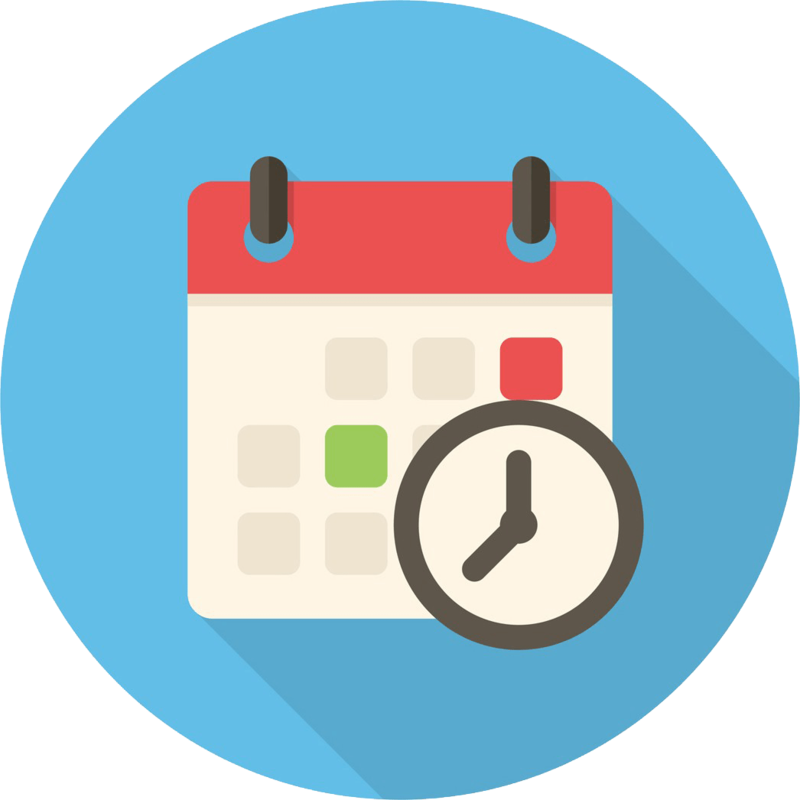 Users may purchase time in the service to unlock a number of benefits. None of the changes affect gameplay, so players need not worry about any sort of pay-to-win mechanic being added to the game. Instead, subscribers have access to a number of additional heroes in casual games, discount coupons for skins and heroes, as well as some other benefits. 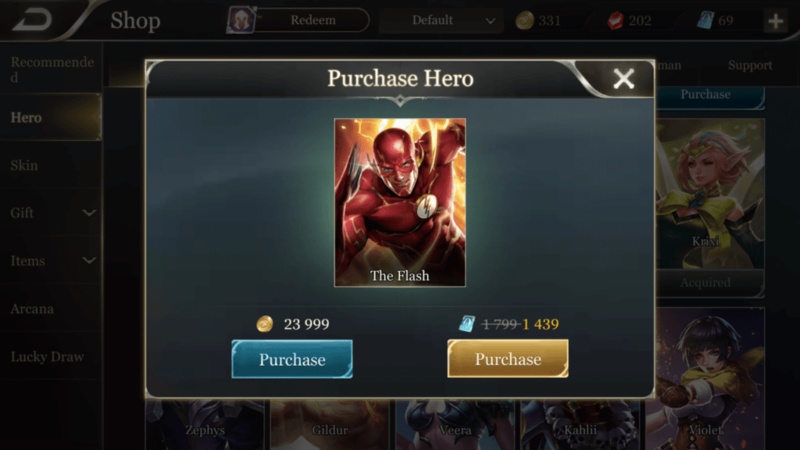 Upon the purchase or renewal of AoV Prime, players will receive a coupon granting them 20% off of a single hero or skin from the game’s store. Depending on the skin purchased, this alone can offset the cost of the service completely (skins like the recent Muay Thai Raz skin, for example). Keep in mind, though, that which coupon you receive is random. Furthermore, the coupons cannot be used on anything outside of the skins or hero purchase tab, so bundles are a no-go. This felt a bit deceptive, so players beware before making their purchase. 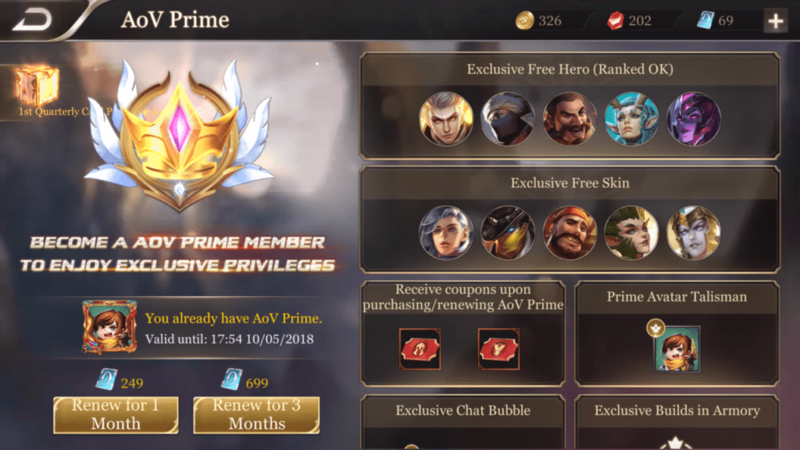 Subscribers to AoV Prime get a few ways to flash their wealth at the F2P peons of the world. The Avatar, chat bubbles, and gifted goods can be crowned with a prime mark, showing the world just how much you support the game. Personally, this wasn’t something I was overly interested in, but some might like being part of an elite club. Prime subscribers will find the game a bit more open to them in a few ways, a number of heroes and skins available to them for “free” while the subscription is active. Five heroes and five skins (for the above free heroes), some additional hero rerolls in Abyssal Clash and Hook Wars modes, as well as some additional slots for pre-made builds. Some might find these useful, especially those who don’t regularly collect heroes. The month-long (presumably) additional heroes can be seen as a valuable trial time for the heroes provided. The 10% bonus gold received from using the skins can give players a bit of a push towards arcana as well. Not really… I mean, The biggest thing here is the additional two item builds which… a few heroes might have five viable builds? Really, if a hero is that flexible, players should just pre-order items manually in game. If you like flexing your bling, it’s not that expensive to get a subscription. That said, I didn’t exactly have fluttery, happy feelings when buying it for this article. If nothing else, several ways in which it is presented make it feel pretty gross. 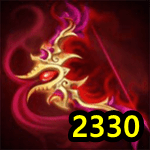 Unlike AoV Prime, a form of Xeniel’s Codex is available to all users, free or otherwise. Those familiar with the battle passes in either Fortnite or Dota 2 will already have an idea as to what’s going on. Players level up the Codex with points, or “Tribute”. These points can either be purchased or earned by completing various achievements in game. The codex levels up after players collect 100 points, prizes unlocked after reaching certain levels. Players who use the free version of the codex will only receive rewards every three or four levels while those who opt for the paid version will get rewards each time they level up. In addition, while free users receive rewards up to level 40 of the codex, those who paid to upgrade their codex continue to do so until level 80. Players earn Tribute by completing quests in game. 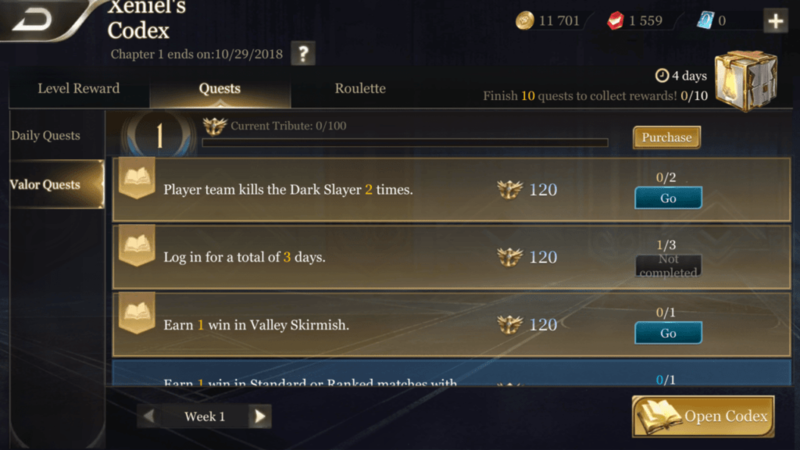 All players receive a single Daily Quest every day and a number of weekly “Valor Quests.” Unlike the daily quests, the Valor Quests do not have a time limit and are still available to players in the weeks after they unlock. Elite Codex purchasers also have three weekly “Codex Quests” available to them. These quests are harder than normal quests but additionally offer higher amounts of Tribute on completion. Quests can entail participating in specific game modes, getting a certain number of kills when using a specific hero class, winning with friends, and so on. Daily Quests may be refreshed if the player wants a different challenge, however doing so will not refresh the quest’s time limit. The rewards available in the codex are numerous, ranging from coupons, gems, magic crystals, and avatars. People who purchased the elite Codex will naturally have more extravagant rewards available to them, skins, heroes, and even an exclusive skin after hitting level 80. 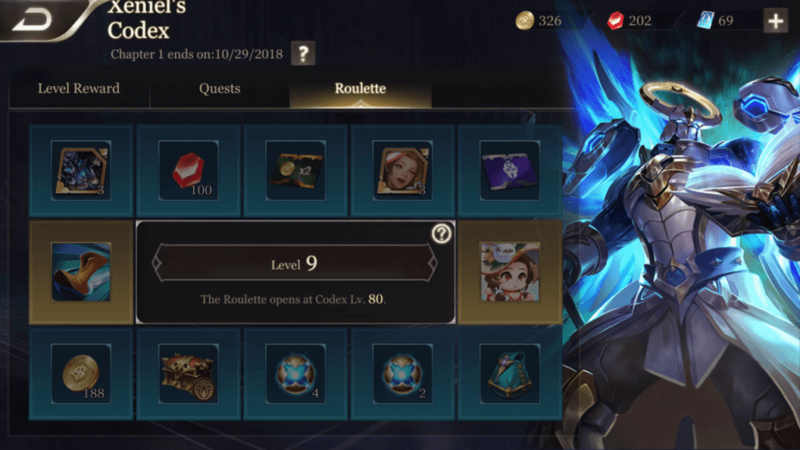 After hitting level 80, players can spin a special roulette wheel for prizes by using any leftover Tribute they have. Unlike the Daily Spin or Lucky Draw, however, players can only land on each space on this wheel one time. After each prize has been received, the wheel will lock until the next codex is unlocked. In my opinion? Yes! Granted, the value is heavily based on how much you play the game. However, buying the elite Codex and even getting it half way will get you a skin and a hero along with a number of magic crystals, gems, gold, and other fun stuff. Players are free to browse through all of the rewards before purchase and don’t have to purchase right away to gain the rewards. Should a player unlock their codex after reaching level 10, they’ll still receive all of the premium rewards prior to that point. They will have just missed out on the bonus quests and thereby have had a harder time leveling in the first place.